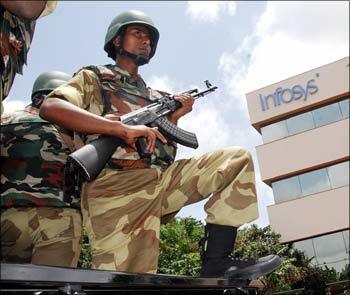 Software giant Infosys on Friday came under the security blanket of Central Industrial Security Force (CISF), becoming the first private firm to be protected by the force which usually guards government installations. The commencement of the CISF deployment at the Infosys campus was marked with the hoisting of the CISF flag by company chairman and chief mentor N R Narayana Murthy followed by a ceremonial guard of honour by the force and the official handing over of the security keys by the Infosys. The Bangalore-headquartered Infosys, which was reported to be on terror radar, had approached the Union home ministry earlier this year for a protective cover over and above the capabilities of their own private security wings and agencies. 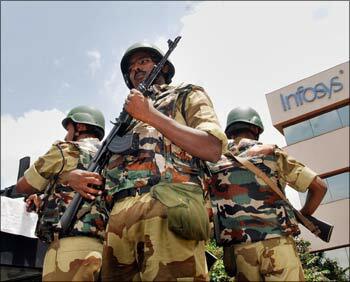 Image: CISF personnel positioned at Infosys campus in Bangalore. This is the CISF's first assignment after the force was mandated to protect the private sector with an amendment in the CISF Act in January this year following the Mumbai terror attack. "This is the first time, since its creation in 1969, that the CISF will be providing security cover to a corporate organisation in India," CISF Inspector General R K Mishra said. CISF would deploy 101 personnel, comprising 70 per cent jawans, to ensure "unobtrusive but all inclusive security," he said. 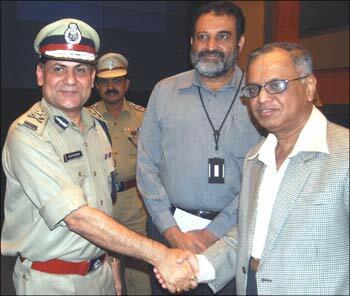 Image: CISF Inspector General (western sector) R K Mishra with Infosys chief mentor N R Narayana Murthy and Infosys board member Mohandas Pai in Bangalore. 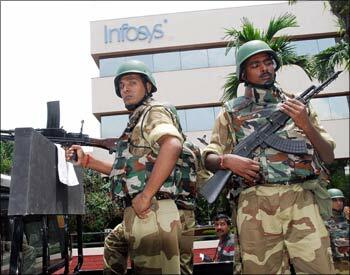 Infosys, the country's second largest software exporter, would incur a cost of Rs 100,000 per day and Rs 3.6 crore (Rs 36 million) annually for the security cover provided by the central force. The cost structure was similar to the public sector being charged for these services. Murthy said Infosys had been in discussion with Prime Minister Manmohan Singh and Home Minister P Chidambaram for providing protection to the "visible signs of progress India has made in the last 20 years", which included extraordinary institutions, educational institutions and companies like Infosys, which had created jobs and raised India's image. 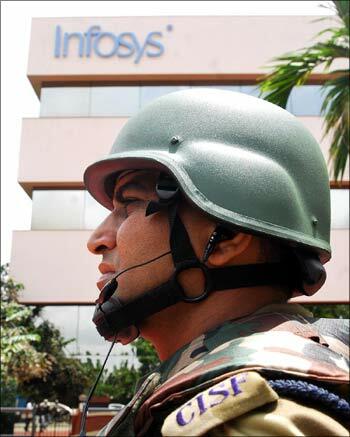 Image: A CISF soldier at the Infosys campus in Bangalore. "We are happy again to have broken new grounds", he said referring to Infosys being the first private firm to receive the CISF cover, adding, "We are the most secure corporate entity today." He said, "While the mandate to keep a distance between CISF and ourselves as demanded by protocol remained, we will show our abundant affection and respect." CISF would not be involved in daily frisking or gate checks but would watch all activities. Image: CISF solider positioned at the Infosys campus in Bangalore. CISF security will ensure "armed" protection for the firm with the help of Quick Reaction Teams and commando units, besides the existing security, and access control measures deployed by Infosys. "It will be a seamless integration," Mishra said when asked about the coordination with the firm's security force. In case of an armed attack, the CISF, which had been well-equipped, would follow the principle of "delay of entry, denial of entry and neutralising those trying to attack". Image: CISF personnel at the Infosys campus in Bangalore. 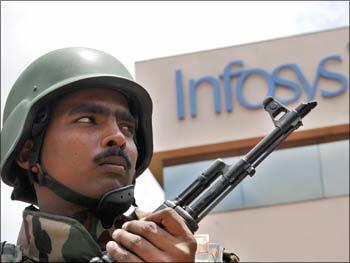 Infosys would also extend the CISF to its Mysore campus and subsequently elsewhere if needed. The number of 101 personnel might also be augmented if required, Mohandas Pai, member of the Infosys Board, said. The security cover will be rolled out in three phases. The second phase would include the Electronics City where Infosys along with other companies nearby would bear the cost of the CISF cover. The third phase would be an electronic surveillance from Hosur Road to Electronics City where the Infosys campus is located. Mishra said the CISF had been sensitised to dealing with employees and since they had worked at airports they were familiar with interfacing with civilians. Mishra also described the CISF as the most techno-savvy force with the personnel possessing an in-depth knowledge of equipment. Currently, he said 79 petitions seeking CISF security cover had been received of which 10 has been processed. 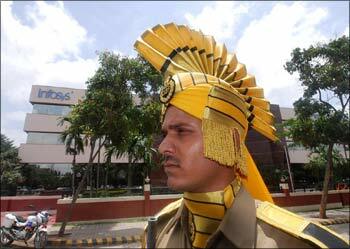 Image: A CISF jawan at the Infosys campus.